Along with the flagship Flare Infinity, Cherry Mobile also unveiled the successor the Flare X, and as you might have guessed, it is simply called the Cherry Mobile Flare X2. 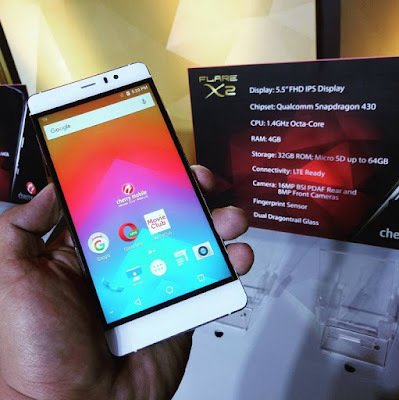 The Chery Mobile Flare X2 packs a 5.5-inch 1080p display powered by 1.4GHz octa core Qualcomm Snapdragon 430 coupled with 4GB of RAM and 32GB of expandable storage. These specs are common on more expensive devices from other brands, but the X2's asking price is a few thousand pesos more affordable at Php7,999. This dual SIM handset comes 16MP BSI main shooter with LED flash and an 8MP front selfie snapper. The other major selling points include front and back Dragontrail glass, LTE connectivity, fingerprint sensor, Android Marshmallow and 3,000mAh non-removable battery. In terms of availability, Cherry Mobile did not mention any, but we will try to get more info and update this post once details are obtained.